The phrase “This is not the update you are looking for…” comes to mind. I like a lot of people were expecting to be doing online heists over the summer period. But we will have to wait, as this is not that update. This is the “I’m Not a Hipster” Update which is now available for Grand Theft Auto Online. This new content update features new retro print tees, skinny jeans, hairstyles, tattoos, animal masks and more, as well as additional enhancements to general gameplay to ensure the world is constantly evolving. A tuned up Rhapsody and Warrener hit the streets. Even Ammu-Nation is getting in on the latest non-ironic trends with the Vintage Pistol and Antique Cavalry Dagger now in stock. Make sure to try all these out in the slew of new Jobs, as part of your long arduous journey to become one of Los Santos’ effortlessly cool. Along with today’s update, gear up for 12 new Jobs across an assortment of game modes, including Races that provide showcase opportunities for these new retro rides, a Deathmatch in Puerta Del Sol, two new Captures and more. There are also three new Gang Attacks in Chumash, East Vinewood and Mirror Park. Students of style know that what comes up must go down. Drop 4,370 feet while imagining you’re over all the bands you listen to on Radio Mirror Park, as you twist and turn sharply down to the pond below. Any skinny jeans wearer will tell you, sometimes things just don’t fit. Try and squeeze up to eight compact cars around the tight corners of this lap Race in Mirror Park. If your friends caught you drinking anything except a flat white at an independent coffee house it would be social suicide, but when you need java, you need java. This is a Point to Point Sedan Race from Del Perro to Mirror Park passing by four ‘Cool Beans’ coffee shops. They don’t know how it started, maybe two girls got the same tattoo, or reposted a Snapmatic without giving photo credit. What they do know is sides have been chosen and East Vinewood’s gone to hell in this two team Last Team Standing. All your friends are going East in search of the last un-gentrified patch of turf in the country, and you’re heading West. Load up a so-uncool-it’s-cool Sedan, and race toward Little Seoul. Lots of straights and a few tight turns at the end of this point to point track. After twelve hours ‘rolling’ at your local post-industrial techno-house night, your tattooed friends will be too wide-eyed to drive themselves. Pick up some taxis for them in this two team GTA-style Capture based around the Downtown Cab Co depot in East Vinewood. Because driving around Rockford Hills in nice cars is too mainstream, and going through Vespucci Beach in low riders is kinda yesterday… This Compact class Race takes you back and forth over the Los Santos Freeway and in and out of the Casino parking lot. Every artist wanted to die young, then they wanted to mock their predecessors with an ironic statement about dying young, now it’s a post-ironic statement and they might end up actually dying. The brand new Dubsta unlocks at Rank 100 and can accommodate up to 6 players, perfect for rolling out in force with Crew members. – Pure Gold and Brushed Gold paint colors have been added to LS Customs in the ‘Metals’ category. These unlock at Rank 100. – A new Pure Black window tint has been added to LS Customs, along with four new jazzy vehicle horns (including one which loops and speeds up / slows down as you drive). – Eight new individual player celebrations and four new paired Celebration animations have been added. – Players will no longer be charged Insurance costs if their vehicle is destroyed by another player who does not have enough GTA$ to pay. – Fixed an issue where, if an insured Personal Vehicle was destroyed, both parties had to pay the insurance costs. – Fixed an issue where some four-wheel drive vehicles had reverted to two-wheel drive. – Players are now able to bookmark Jobs whilst in a Playlist from the Pause menu. – Tear Gas now does more damage and lasts longer. – A small tick has been added to the first screen in the corona if a player has played a Job before, much like in the pause menu or Next Job Voting Screen. – The level of difficulty is now displayed when pressing D-pad down when playing Missions. – This update also includes a host of other adjustments, game tuning and exploit fixes. For the complete list, please visit the Rockstar Support site. 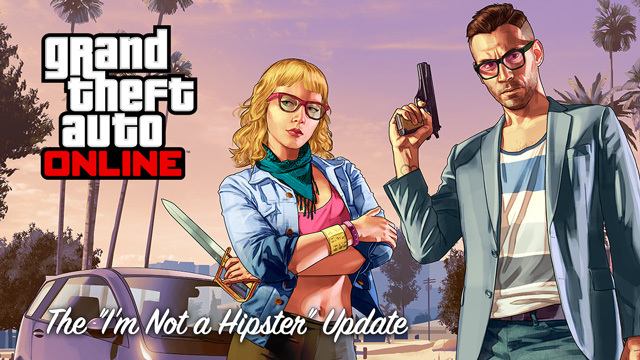 To download the “I’m Not a Hipster” Update, just boot up your online-connected PS3 or Xbox 360 and start GTAV. You’ll be prompted to download the automatic update (1.14) and Xbox 360 players will also be required to download an additional compatibility pack upon entering GTA Online.